Bounded by the sea, Montnegre Park, and the Litoral and Corredor mountain ranges, the county of Maresme offers tourists beautiful beaches and a surprisingly hilly landscape. A summer destination for Barcelona's bourgeoisie in the 19th and 20th centuries, it conserves an impressive Modernista heritage and retains a thriving cultural identity, with museums, cultural festivals, music festivals and crafts fairs for you to enjoy. There are dozens of towns and villages to see and a visit is highly recommended. In spite of industrialisation, the Baix Llobregat has conserved some fascinating virgin natural areas, such as the Montserrat Natural Park, a unique massif and a Mecca for the most intrepid climbers. You can watch migratory birds and enjoy long beaches of fine sand in the Llobregat delta, while in Gavà there is one of the largest and best-preserved Neolithic sights in Europe. It is also possible to visit the impressive Salnitre cave in Collbató. Garraf is a paradise: 25 kilometres of coastline, the Garraf, Olèrdola and Foix natural parks and a wonderful climate that makes it possible to enjoy them all year round. There are towns which are authentic treasures, such as Sitges, the spiritual capital of Catalan Modernisme, which has an intense artistic and cultural life. At Vilanova i la Geltrú, one of Catalonia's most important ports, the fish market is a must for all visitors. You can get around the countryside on foot, but also on horseback and by bicycle: various companies offer guided tours. This region is synonymous with wine tourism and vineyards. Its wines and cavas are internationally recognised. Vilafranca's Vinseum, the Catalan Wine Culture Museum, helps you to discover all its secrets. However, there are other places of interest that are unconnected to wine: Gelida Castle, the monuments of Olèrdola, originally an Iberian town, and the emblematic sites used by the Republican airforce during the Civil War, at Santa Margarida and Els Monjos, are also top tourist attractions. The medieval monastery in Sant Cugat del Vallès is the jewel in the crown of this county, which developed in the shadow of Collserola Park. Sabadell and Terrassa, the two joint capitals, have a major industrial heritage, with factories and steam mills converted into modern public buildings that are open to the public. The Vallès Occidental is also a cultural region: it is home to the Terrassa Jazz Festival, the Cerdanyola Blues Festival, and Sabadell has an annual opera season. Montseny Natural Park is one of the marvels of the Vallès Oriental: leafy woodland, vast meadows and mountain scenery such as the Turó de l’Home and Les Agudes, Matagalls and Pla de la Calma. On the Raspall Route, you can discover Modernista urban planning and architecture in towns such as La Garriga, El Figaró and Cardedeu. There are still medicinal spas In Caldes de Montbui, something the town has been famous for since Roman times. The Cadí-Moixeró Natural Park is also known as the Barcelona Pyrenees. It is a spectacular natural setting where visitors can go climbing, mountaineering, and in winter, skiing. Its Romanesque past is still evident in its churches and shrines, and it still retains the mining route, a reminder of the importance of coal in this county's social economy. There are some almost magical places, like the site of 3,000 dinosaur footprints near Fumanya: a window to 65 million years ago. 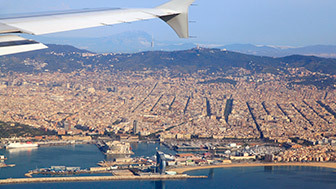 Barcelona Province consists of an extensive territory between the Serra del Cadí mountain range and the Mediterranean Sea. Here there is a wide variation of landscapes and a rich cultural history. The coastline stretches for 100 kilometres, with cities and beautiful fishing villages that have managed to retain their true essence over the years. Another attractive feature of the province is the imposing nature of the interior: there are over 100,000 hectares of protected land, twelve natural parks and a biosphere reserve, really beautiful places that can be visited in one day. There is a whole world to discover less than an hour from Barcelona. For example, those of Sitges, Garraf and Vilanova i la Geltrú to the south, and all those in the Maresme to the north. There are long, sandy beaches, small, hidden coves and places where naturism is permitted. There are twelve protected natural parks near Barcelona, offering the chance to enjoy nature and do all kinds of outdoor activities throughout the year. The Penedès region, which has been associated with wine for centuries, offers you the chance to discover the country's wine-growing economy, which has also expanded in other areas in recent years, such as Alella and Pla de Bages. The Llobregat delta offers beaches, pine woods, marshland and a river, where you can walk and watch birds. The Besòs Fluvial Park is a magnificent place for enjoying nature and leisure. There are nine Modernista routes available near Barcelona: they include wonderful Gaudí buildings, summer residencies, palaces, mansions, factories, wine cellars and romantic gardens. Hidden shrines and hermitages, monasteries, medieval cities, paintings and more besides. Catalonia's medieval past is well-preserved in the towns around Barcelona. Standing at a height of 725 metres, this is one of the most important shrines in Catalonia, home to La Moreneta, patron saint of Catalonia, a Romanesque wooden sculpture dating from the 12th century. The Escolania de Montserrat's children's choir performs in the basilica once a day. You can also visit the cave where tradition says the Virgin Mary once appeared. You get to the monastery on the Santa Cova funicular railway. This industrial village of Modernista origins is located in Santa Coloma de Cervelló, in the Baix Llobregat. It is a complex of singular buildings constructed in the 19th century which are maintained in all their glory. One of Gaudí's lesser-known buildings is a notable feature of the complex: the Colònia Güell church, also known as the Gaudí Crypt, which has been declared a UNESCO World Heritage Site. At the end of the 19th century, Santiago Rusiñol, the gifted Catalan artist and intellectual, bought two fisherman's houses in the town of Sitges and converted them into his house and studio. In 1933, this temple of art was opened as a museum. His valuable art collections are conserved there. This cultural heritage centre was founded in 2007 and it consists of different cultural, touristic, scientific and leisure areas and services. It is made up of the Sant Benet de Bages medieval monastery, which has a busy cultural diary, the Fundació Alícia, which carries out food research, and the Hotel Món, which is ideal for holidays. Located on the Barcelona - Valls road in Garraf, Cellers Güell is made up of two Antoni Gaudí buildings from 1900, originally designed as a wine cellar and a house. The cellar, built entirely in stone, is one of the architect's most fascinating constructions, with its impressive triangular profile. In the mid-19th century, Terrassa became one of Spain's leading industrial cities. The city's industrial bourgeoisie left behind an impressive legacy of country houses, steam mills, factories and other buildings that can still be visited today. Every year, Terrassa organises the Modernista Fair during the second weekend of May. Located between the Penedès plain and Garraf, the Olèrdola branch of the Archaeological Museum of Catalonia provides evidence of the rise and fall of civilisations in the area: there is an Iberian village, a Roman fortification and a medieval city with Pre-Romanesque and Romanesque churches. You can walk around the natural park and the monuments, and there are also guided and dramatized tours. This museum is located in the centre of Vilafranca del Penedès. It is housed in a medieval palace that belonged to the Crown of Aragon and also contains the Sant Pelegrí Gothic chapel, which today holds temporary exhibitions. The Vinseum is the first wine museum in Spain and one of the first in Europe. It covers the history of Penedès winemaking from an anthropological perspective. 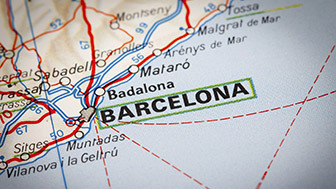 The area around Barcelona includes the Maresme, Vallès Oriental, Vallès Occidental, Baix Llobregat, Garraf and Alt Penedès counties, which are all first-class tourist attractions for discovering the heart of Catalonia. Their proximity to Barcelona means that you can go on day trips or choose to stay for a few days. As well as the hotels and apartments you can find, especially on the coast, there are also holiday cottages and guest houses in the interior, which are a good way to get to know the area and enjoy its natural, historical and cultural heritage. The coastal towns offer all the attractions of the seashore: coves, beaches, the chance to do water sports such as sailing and scuba diving, and a wide range of food, featuring seafood dishes. In the interior, you can go on walks through the woodlands of Montseny and Cadí, go hiking in the mountains and go climbing, as well as skiing in the winter. There are also cultural activities on the seashore and in the mountains. Touring the towns of central Catalonia provides the opportunity to learn about the history of the country. The marks of our ancestors remain in the form of castles, monasteries, old medieval town centres and Modernista industrial buildings. There are also popular traditional festivals, some of which, like the Patum of Berga, are protected by UNESCO. There are still complete medieval towns, with cobbled streets and rustic houses, such as Rupit and Tavertet. In Vic, one of the oldest cities in Catalonia, there is a market whose origins go back to medieval times and it has an exceptional porticoed main square. Culinary tourism is another great attraction of the Barcelona Province counties, which are intimately linked to wine culture and have managed to maintain and revive a high-quality wine-growing economy. There are five wine Designations of Origin in this area: Penedès, Alella, Pla de Bages, Catalunya and Cava. Apart from going to the area's wineries, which are open to visitors, you can also enjoy local festivals linked to rural life and wine-growing.